My name is Amanda Brown and I am an artist who specialises in pet portraiture. I live in the UK in the county of Kent. I receive new painting challenges every week which I enjoy very much and I have created this site so that I can get in touch with the rest of the world. I began painting when I was very young like most of us, and continued with a keen interest throughout my primary and secondary education. I had to make an awkward decision when I was about thirteen between Music and Art, music being of equal interest to me at the time, as I was only allowed to continue one of them as a GCSE subject. I chose Art and what a good decision! 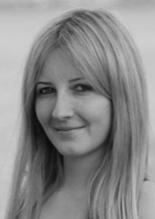 I completed three A-levels including Art & Design and went on to do a Foundation course at Kent Institute of Art & Design which broadened my knowledge of all types of art. After my course I applied for a degree in Fine Art. I was accepted but I later I turned it down as I found myself fed up with being a student and decided to get myself a full-time job. However I found that just painting and drawing for myself was not enough for me (beside the fact that I ran out of dogs to draw! ), so I have taken the necessary steps to turn myself into a pet portrait artist. 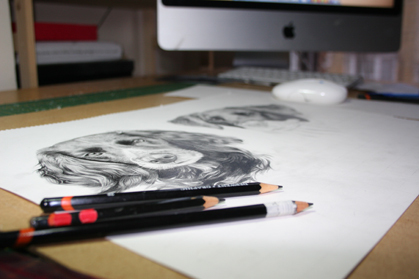 I moved into my own house just after the new year in 2008 and have a well organised studio where all of my portraits are created. I regularly work early in the morning and late at night so I have a couple of daylight lamps which work as many hours as I do. Lighting is extremely important when painting and drawing and using a daylight lamp indoors is like seeing for the first time and key to getting colourings and shading spot on. 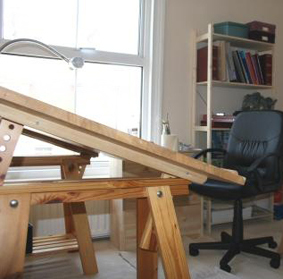 I now have two working areas in the studio, one for painting and one for drawing so that I can keep the two separate. I work on both pencil portraits and oil portraits at the same time because the paintings are built up with layers meaning they need drying time in between. So as the paintings are drying, I work on the pencil drawings to maintain a constant flow of work without the need to pack up the oils each time. 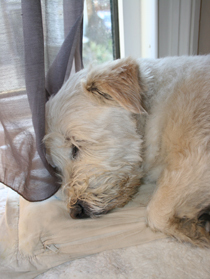 My dog Toby can often be found snoozing by the studio window, he doesn't have a bad life really does he! My family has kept dogs and cats for as long as I can remember, I have had a rabbit, a fish and even a newt! But I have always wanted my own dog. 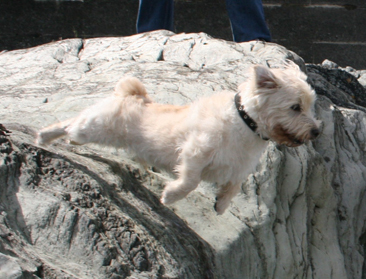 I finally got the chance when I moved out of my parents house in 2008 but Toby was an unexpected arrival. Just after new year, my step-dad's father died and it was a really tough time for my step-dad. 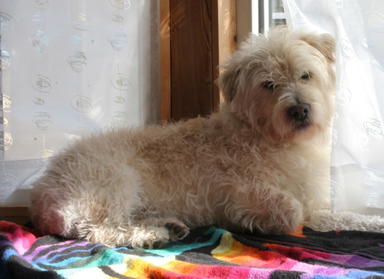 To make things worse, his father had left behind an 11 year old westie. 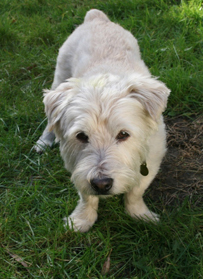 My parents could not keep him as he fights with Spanner (their jack russell) and they were reluctant to put him in a dog's home as he had been a one man dog all his life. So I decided to take him on! When I picked him up he was crazy and smelly and very confused about what had happened to his owner. It was quite tough looking after him as he scratched and cried at night (not the best way to make friends with our new neighbours!) 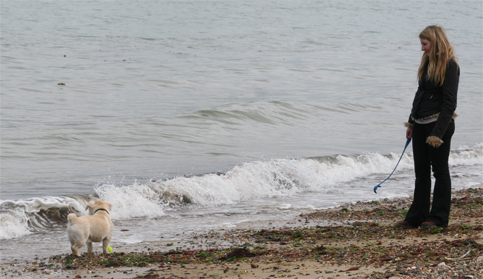 But we stuck with each other, and a few years later Toby had settled in completely. I really wouldn't be without him now. 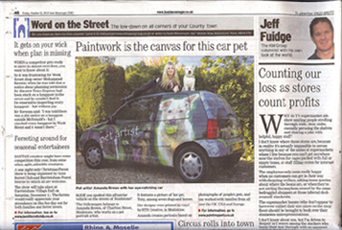 If you live in Maidstone or the surrounding areas, you may well have seen my pet portrait-mobil. 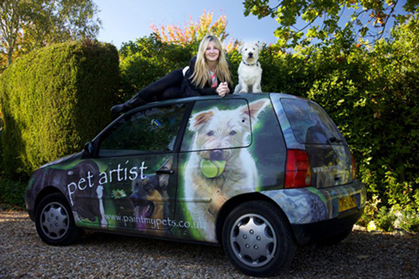 I use my car to visit and deliver locally to my clients and I thought it would be a great idea to transform my little Volkswagen Lupo (formerly blue) into a mobile advert for my pet portraits. As you can imagine it captures peoples attention wherever it goes and I managed to get a little bit of publicity from it in the Kent messenger last year. All of the pictures on it are paintings that I have done which I scanned at a high resolution. I took these scans to a local vehicle signwriter who worked with me to come up with a design for the car and then the design was printed on vinyl and wrapped around my whole car. 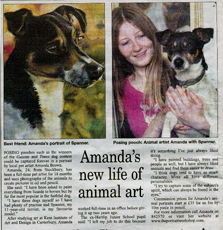 I had to think of a slightly snappier web address that people could remember easily (paintmypets.co.uk) which directs to this website for people to find out more about my pet portraits.